A star studded line-up of comic royalty including New York Times bestselling author and writers Mark Waid (Daredevil, Hulk, Kingdom Come), Robert Venditti (Green Lantern, The Flash, Surrogates) and Tony Moore (co-creator of the Walking Dead) headline over 225 exhibitors and comic creators at Derby City Comic Con, Louisville’s original comic con! Returning to the Kentucky International Convention Center in downtown Louisville for its fourth year and first two-day convention on June 28th and 29th, the event just keeps growing, pushing its current 45,000 square foot event space to its max. Over 4300 comic book fans turned out for the third annual Derby City Comic Con last year, (which marked over 44% increase from 2012) and we're expecting an even larger crowd this year! "If you think you know Derby City Comic Con, you haven't seen anything yet" says convention director and owner, Chuck Moore. Located in the heart of downtown, Derby City Comic Con brought a comic centered convention to Louisville, KY for the first time in 35 years in 2011. Now in its fourth year, the crowds and excitement continue to grow even as the price of admission remains incredibly family friendly. Single day passes are only $10 and a full weekend pass is only $15 per attendee and comes loaded with show extras. As always, kids 12 and under are free with a paying adult. This year Derby City is bringing back everything fans loved about the convention form year’s past, only we're making it bigger and better. Charity Partners: Derby City Comic Con is trilled to be raising money through our silent auction and other efforts in support of the Kosair Charities once again partnering with the organization in 2014. Kosair Charities supports over 90 children's agencies across the state of Kentucky and Southern Indiana. Additionally, Derby City Comic Con is once again working with Big Brothers Big Sisters of Kentuckiana providing passes to a massive mix of "Matches" allowing the children and their mentors access to visit the convention together free of charge. Comic Creators and Artists: On our convention floor we share a premiere mix of regional and national comic book talent. Offering the best of Louisville as well as the larger industry all in one event space. You will find comic creators, writers, and artists ranging from those just getting started to those who have influenced a generation of professionals. Vendors and Exhibitors: Here at Derby City Comic Con we love our vendors. In 2014 we’re presenting over 100 tables filled with comics, toys, magazines, Legos, posters, cards, gaming supplies and more! It's enough to fill an entire weekend just shopping and exploring everything they have to offer. In addition, we’re also thrilled to present a mix of interesting exhibitors you'll want to chat with including the Mandalorian Mercs, Corn Island Steampunk Society, the Louisville Cartoonist Society, the Louisville Free Public Library, the Louisville Arcade Expo and many, many more! Kids Activities: Derby City Comic Con is committed to being a family friendly event. In addition to kids under 12 getting in free with a paying adult, a dedicated kids corner with a Marvel Agents of S.H.I.E.L.D. inspired theme will present activities and games all weekend keeping our littlest heroes entertained and excited. Costume Contest: The amazing costumes fans create every year for Derby City Comic Con are always a highlight of the weekend for attendees and this year our costume contest is bigger than ever, covering two days with two separate events! Don’t miss the adult costume contest Saturday at 3:00 PM with a $100 Grand prize for best costume! The kids won’t be left out of the fun either as their contest is set for Sunday at 3:00 PM. Parties: We have two side events planned for Friday and Saturday night! Both are set to take place at the Haymarket Whiskey Bar (one of the top whiskey bars in the country) located at 331 E. Market St. Friday night, Derby City Comic Con’s Opening Night Party will be a Steampunk Celebration. The event for our fans is being sponsored by the Corn Island Steampunk Society and will feature a talk on creative mixology by Calamity Labs. Saturday night we have a special treat for our adult guests! Starting at 8:00 PM you’ll witness live art created by the Six Bomb Boards art collective then at 10:30 you can enjoy a concert from the gypsy punk stylings of Lexington’s Ford Theater Reunion. We’re just scratching the surface of what’s planned for this year’s show and we invite you to visit www.DerbyCityComicCon.com to get all the details. ALLEN PARK — Dr. Malvinder Grewal, formerly of the Animal Planet TV program, “Animal Cops:Detroit,” has opened her first owned practice at 7430 Allen Road. Called Healing Care Animal Hospital, Grewal's practice accepts dogs, cats, guinea pigs and rabbits. The hospital is at 7430 Allen Road, the former site of Brose Electric Lighting One. 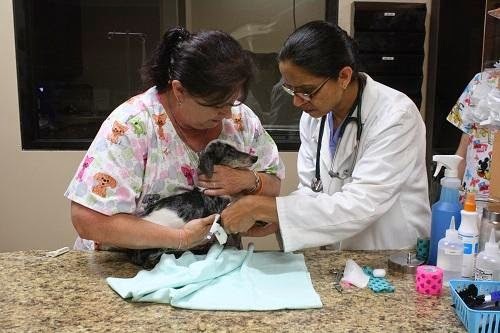 In addition to traditional veterinary services, Healing Care Animal Hospital offers holistic and herbal treatments, including acupuncture, as well as rehabilitation, massage and laser therapy. Grooming and boarding services are also offered. Some rehabilitation exercises include the use of specialty exercise balls designed to encourage dogs to use all four legs for balance, which encourages strength. Healing Care also uses a saltwater pool for hydrotherapy. The pool is used as rehabilitation post-surgery. Pool sessions are also recommended for geriatric, obese and arthritic animals, and a hospital employee is always in the water with a pet. Acupuncture sessions are recommended for animals with skin issues, behavioral issues, cancer and arthritis. Grewal explained that acupuncture works for animals in the same sense it work for humans. A needle is used on specific points on the body to stimulate chemical substances to promote healing and relieve pain in the body. Grewal recommends acupuncture especially for arthritic dogs as she said they do not respond well to drug treatment. Healing Care will soon be offering a gait analysis and treadmill rehabilitation sessions. Nutritional testing and chiropractic offerings are planned as well. She said she chose Allen Park as her business' home because it's a part of her roots – her very first volunteer veterinary position was in the city. Healing Care Animal Hospital is open 8 a.m. to 7 p.m. Mondays through Fridays and 9 a.m. to 5 p.m. Saturdays. The animal hospital offers 10 percent off discounts to seniors and military. For more information, call the business at 1-313-791-7252 or visit its website, healingcareanimalhospital.com. This story was originally published in the News-Herald Newspapers, reprinted with permission. 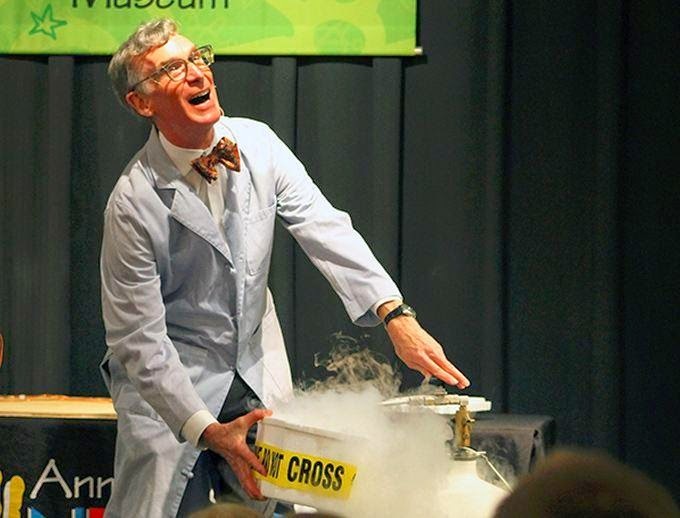 ANN ARBOR — Bill Nye The Science Guy made a surprise visit to the Hands-On Museum while he was in Ann Arbor Wednesday. Nye was in town to deliver the keynote address at an annual conference held by Ann Arbor-based supply chain design and software company, Llamasoft. During his time at the museum, Nye hosted a special science presentation during which he wowed fans with several hands-on experiments. Click here for a photo gallery of Nye's presentation at the museum. This article was originally published by Heritage.com, reprinted with permission. The Detroit Derby Girls, Michigan’s premiere female roller derby league, partner with Eastern Market’s Sunday Street Market for an exhibition bout on Sunday June 29, 2014 at 2 pm. New to Eastern Market this year, the Sunday Street Market focuses on hard-goods vendors featuring home goods, art, jewelry, Michigan-made products, antiques, entertainment, food trucks and more. Detroit Derby Girls skaters and volunteers will be playing in a mixed scrimmage and will have merchandise for sale at the event. There will be no charge to spectators for this event. The exhibition game will take place behind Eastern Market’s Shed 3 at 2934 Russell Street, Detroit, 48207. Spectators are encouraged to bring their own folding chairs as seating will be limited. Some may remember derby from when it was popular in the 70’s. As it has emerged in its current comeback, there is still plenty of entertainment, but it is much more competitive athletic sport than the theatrical version of the past. The Detroit Derby Girls league is comprised of five intra-league “home teams” and three inter league travel teams that compete at international, regional, and local levels; their international level team is presently the highest ranked team in Michigan in the Women’s Flat Track Derby Association rankings. Detcon1, the 2014 North American Science Fiction Convention, is thrilled to announce that Jon Davis will be attending Detcon1 as Video Games Special Guest. 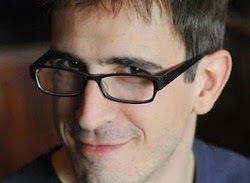 Mr. Davis has spent the last 18 years as a programmer in the video game industry. He currently works for Respawn Entertainment as a member of the team that created Titanfall, one of 2014′s most anticipated games. Starting with PilotWings 64, a launch title for the Nintendo 64, he has worked on a wide selection of video game genres across several well-known franchises including EverQuest 2, Call of Duty: Modern Warfare 1 and Modern Warfare 2. At the convention, Mr. Davis will share stories from his career, participate in “play the developer” sessions, and offer advice for those interested in entering the video games industry. Funeral services for American entertainment icon and proud Arab American Casey Kasem will take place Sunday. Kasem died June 15 in a Washington State hospital following a long illness. He was 82. The service will be held at the American Druze Society’s cultural center in Eagle Rock, Calif. Kasem was an active member of the Druze, a religious community with ancestral ties to present-day Lebanon, Syria, and Palestine. He was a founding member of the American Druze Foundation and played an integral role in establishing the Society’s Southern California cultural center. Museum’s National Advisory Board, was a personal friend of Kasem’s. She recalls his dedication to his faith and community. Casey Kasem has long been celebrated as an iconic voice of American radio and music, and is also recognized as one of the most famous Arab Americans. He was born Kamel Amin Kasem in Detroit on April 27, 1932, to Lebanese immigrant father and Lebanese American mother. Like many Arab immigrants to Detroit at that time, Casey’s father Amin owned a grocery store. In the 1950s, his mother and aunt owned a grocery store in Fenton, Mich. (near Flint), where Arab immigrants were also succeeding in the grocery business. Kasem is a graduate of Wayne State University in Detroit, where he began his career by performing bit parts in radio dramas. He is a veteran of the U.S. Army who served as a DJ during the Korean War. In the summer of 1970, in collaboration with fellow Arab American broadcaster Don Bustany and other partners, Kasem launched his syndicated radio program, American Top 40, on just five radio stations. Soon the program was heard “coast to coast” on hundreds of stations and later became a TV show. Classic episodes remain on the air today. Kasem also had a successful career as a voice-over actor, most notably as an NBC announcer and the voice of Shaggy (“Zoinks!”) on the children’s cartoon Scooby Do, Where Are You!. In addition to his numerous accolades and awards, including a star on the Hollywood Walk of Fame (1981) and induction into the Radio Hall of Fame (1992), Kasem has always been proud of his Arab heritage. “Whenever I can,” he said in a 1983 interview, “I like to let people know that I am Lebanese, that I am Arabic, and that’s my heritage. I’m an American first, but at the same time I feel strong ties going way back.” Several obituaries recount how Kasem’s entertainment career was inspired by listening to his older relatives’ one-upsmanship style of storytelling as a kid. Throughout his career, Casey Kasem fought against media stereotyping of Arabs and Arab Americans, and has always encouraged young Arab American media producers. He has given selflessly to many Arab American causes, including the Arab American National Museum, lending his sonorous voice to its Making An Impact permanent exhibit and donating multiple items for display, including his Hollywood Walk of Fame plaque and the American Top 40 sign that hung on the program’s Ventura Boulevard studio in Los Angeles. Kasem has been an honorary member of the AANM’s National Advisory Board since the Museum opened in 2005. Casey Kasem’s legacy also includes the new $2 million Post-Doctoral Fellowship in Druze and Arab Studies at Georgetown University’s Center for Contemporary Arab Studies, a first-of-its-kind program. Casey’s daughter, Kerri, also a great friend of the Arab American National Museum, is following in her father’s footsteps professionally and through her community involvement. TAYLOR — For the second year in a row, Wonderworld Comics has been named one of the top comic book stores in the world. A record 37 stores have been nominated for the annual Will Eisner Spirit of Comics Retailer Award, which will be handed out during the San Diego Comic Con International next month. “ One of the top 37 stores in the world is a very awesome complement,” co-owner Dennis Barger said on Facebook when the nominees were announced. The Award is given out yearly to retailers who have done an outstanding job of supporting the comics medium both in the industry at large and in their local community. Comics fans around the world have the opportunity to nominate their favorite stores via the Comic-Con International website. Stores have to be nominated by a customer, they can’t throw their own name into the hat for consideration. Wonderworld has been nominated several times, including the last two years. The store has been open for 9 years. Only one store in Michigan has won the award since it was first given out in 1993. No other stores in Michigan are nominated this year. The award is typically considered the pinnacle award in the comic book industry as it awards creative achievement. Nominees and winners are decided through secret ballot by a panel of judges. This year’s nominee list includes stores from across the United States, plus Canada, the United Kingdom, Australia, and Singapore. The finalists will be announced during the week of Comic-Con, after the judges meet in San Diego. The recipient will be announced as part of the Will Eisner Comic Industry Awards on July 25, starting at 8 p.m..
DEARBORN — In a sentence, it’s time travel by way of drugs. That’s how author Shaun Manning describes his latest graphic novel, which he signed at Green Brain Comics last weekend. That’s when the hijinx ensue. The book’s main character is promised a chance to change the world, and have buddy adventures with his time-traveling companion, but that’s not what happens according to the author. Learning how to access time in that nonlinear way is one of the cornerstones to the book. Published by the Archaia imprint of BOOM! Studios, the book is available at Green Brain Comics, 13210 Michigan Ave., or through other local book stores and online at ShaunManning.com. Wonderworld Comics, in Taylor, just sold off the mother load of comic book back issues. 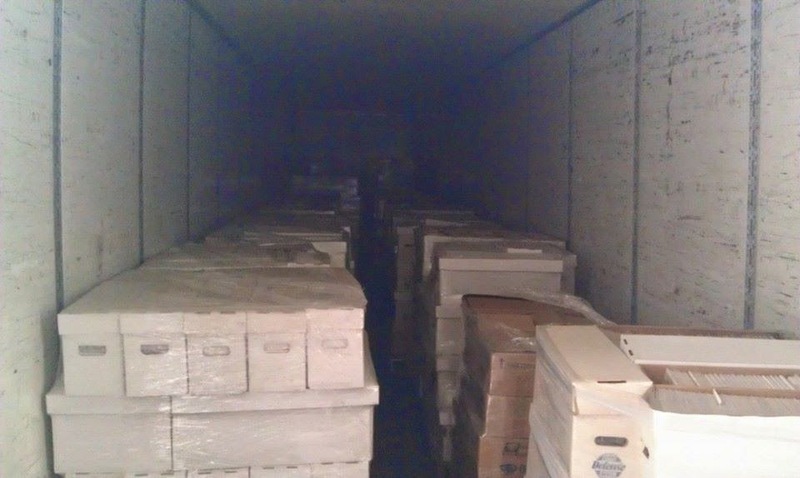 warehouse, and rather than move 30 pallets with more than 700 long boxes of comic back issues, they sold them in bulk. The long boxes included fuller series runs, purchased collections and overstock from both Devil's Due and Desperado comics. Most of the books are already bagged and boarded. 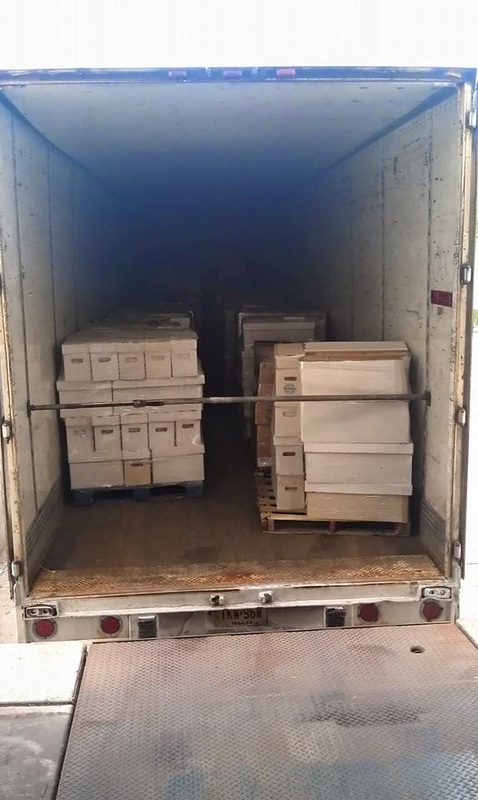 The entire collection was loaded in the back of a semitrailer Tuesday night. "Still had room for one more pallet," Barger said. While he didn't say who bought the books, Barger did say it was a "major retailer. Barger also declined to comment on how much the wholesale discount was, instead saying that he got "a very big check." The community is abuzz about Chad Smith’s return to the Birmingham-Bloomfield area. 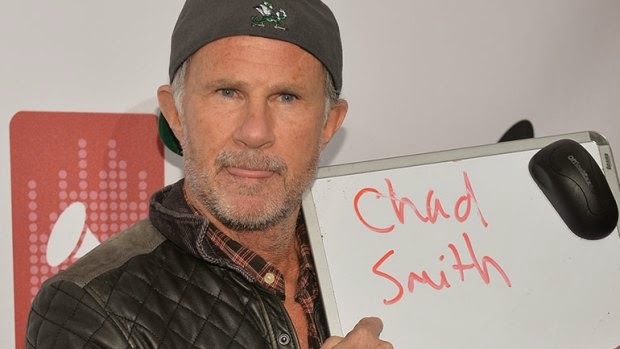 Smith, a Bloomfield Hills native and drummer for the Red Hot Chili Peppers, is heading back to his roots on Monday, June 16. The Birmingham Historical Museum, Birmingham Bloomfield Community Coalition (BBCC) and Axis Music Academy have organized an afternoon and evening with Smith that offers the community three different opportunities to enjoy Smith’s company and talent. All proceeds from the events will benefit the non-profit organizations. • Located at the Birmingham Historical Museum at 556 W. Maple. • Monday, June 16, from 4-5 p.m.
• Limited to 75 people (very few tickets remaining). • General meet-and-greet with Smith. • Enjoy heavy hors d’oeuvres, beverages and a silent auction. • Ticket price: $50 per person. The silent auction will feature a brand new white Fender Squier Strat guitar, the cow bell from Chad Smith and Will Ferrell’s "Drum Off" on the Tonight Show with Jimmy Fallon, a pair of drumsticks from the 2014 Super Bowl performance, an autographed Hall of Fame program and more. Those interested in attending the Backstage Special Event can call the Birmingham Historical Museum at (248) 530-1928. Proceeds from the Backstage Events will support a young singer/songwriter program (to be held at the museum later this summer), and the Hill School Bell Project. Following the backstage events at the museum, Smith will perform at the Berman Center for the Performing Arts (located at 6600 W. Maple in West Bloomfiel). Details for this portion of the evening may be found at www.axismusic.com/news-events, or call (248) 799-8100. Green Brain Comics is welcoming Ann Arbor-based author Shaun Manning into the store on Saturday, from noon to 2pm for a special signing of his new graphic novel “Interesting Drug." Manning is the creator and writer of "Interesting Drug" for BOOM! Studios’ Archaia imprint. Manning is also the Academic Marketing Manager at The University of Michigan Press and occasionally writes for the comic news website, Comic Book Resources. The book is an original graphic novel that mixes high concept sci-fi with elements of a more traditional psychological thriller, with a little bit of Breaking Bad thrown in for good measure. Green Brain Comics is located at 13210 Michigan Avenue, in Downtown East Dearborn. Growing up a child in the 90's there was no lack of want for fun, educational programming. Being a nostalgic person now nearing 30, I've been looking back on things I used to watch with reverie and I realized, there is a huge question that needs to be answered. The two main science shows I watched growing up were "Bill Nye, the Science Guy," and "Beakman's World," both were on TV around the same time period, and were both staples of Saturday morning programming. But which one was better? Beakman debuted in 1991 and ran through '97, while Bill Nye debuted in 1992 and ran through 1998. Toss into the mix the reruns of "Mr. Wizard's World," which originally ran from 1983-91 and now we've got a huge issue going on. An issue that might need to be figured out with some type of experiment. Of course I'm no scientist, so mine will be more of a social experiment, played out in the comments section. Which of the three shows did you prefer to either watch as a child, or that your children watch if you weren't of the target age during the time they were on? 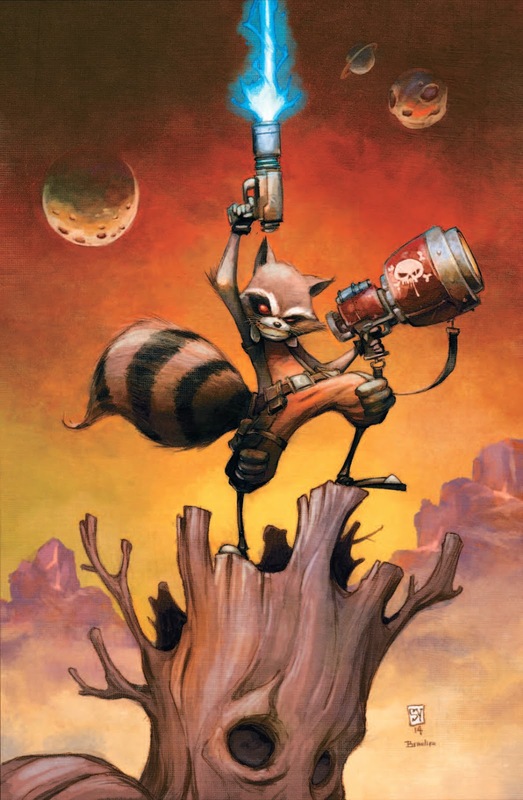 Eisner-Award Winner Skottie Young Goes Cosmic in ROCKET RACCOON #1! This July, blast off with the smallest Guardian of the Galaxy (packing theROCKET RACCOON #1 – written and drawn by Eisner-award winning storyteller Skottie Young! Today, Marvel is proud to present your new look at this highly anticipated ongoing series launching ahead of one of the biggest movies of the Summer! As defenders of the cosmos go, Rocket Raccoon has faced his fair share of battles. He’s been a hero to the weak, a champion of the good, and a protector the innocent. Not to mention a heartthrob to many intergalactic species across the galaxy. But is he ready to be…a fugitive?! Framed for a crime he didn’t commit, Rocket and his pal Groot’s high-flying life of adventure and heroism may be a thing of the past as he’ll soon find himself on the run and on the wrong side of the law. And the authorities aren’t the only one’s hot on his TAIL! (Too easy). An intergalactic boxing match, fierce alien creatures, and a deadly militia of Rocket’s ex-girlfriends known only as the Exterminators – and that’s just the FIRST ISSUE! “But ya know, right after that he’ll probably shoot some stuff,” he continued. It’s one raccoon (but whatever you do, DO NOT call him a raccoon) against the entire galaxy this July as superstar creator Skottie Young brings his A-game! And the galaxy won’t even know what hit it! You do not want to miss the highly anticipated ROCKET RACCOON #1 when it blasts its way into comic shops and digital devices this July! 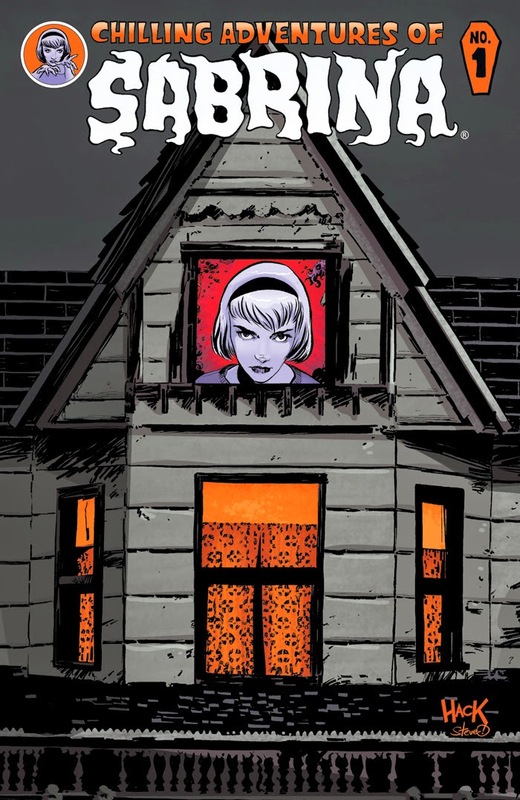 This weeks, Archie Comics announced details for their biggest launch since the hit horror book AFTERLIFE WITH ARCHIE debuted – a new SABRINA ongoing title, from writer Roberto Aguirre-Sacasa (AFTERLIFE WITH ARCHIE) and artist Robert Hack. 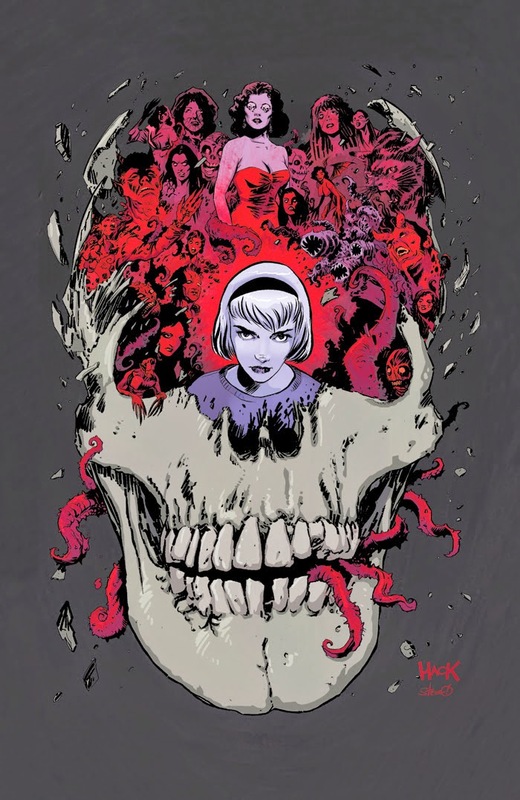 The series, which promises to show fan-favorite character Sabrina in a way fans have never seen her, builds upon the success of AFTERLIFE WITH ARCHIE and expands the company’s line of horror-centric offerings. SABRINA #1 is slated to launch in October. 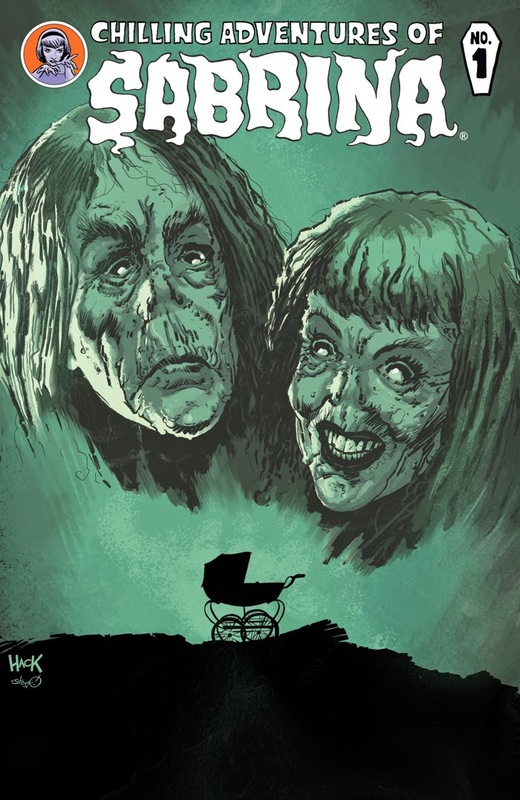 Here’s a sneak peek at the covers to the first issue. 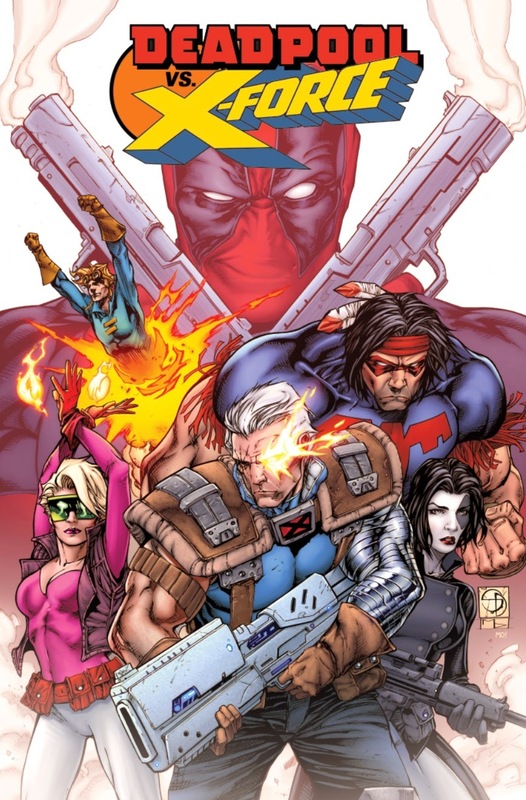 This July, big guns, big pouches, and big action all return as your favorite mercenary goes toe-to-toe with that band of militant mutants inDEADPOOL VS. X-FORCE #1 – the first issue in a bombastic new limited series from writer Duane Swierczynski and artist Pepe Larraz! Journey back to the long-forgotten days of the 1990s, when two characters made their thunderous debut and would go on to change the face of Marvel Comics forever. This June, Original Sin continues to send shockwaves through the Marvel Universe as two of Earth’s Mightiest clash in a battle for the ages – and neither will walk away the same, if at all! Today, Marvel is proud to present your very first look at HULK VS. IRON MAN #1, the first issue in a 4-part crossover that pits the Green Goliath against the Armored Avenger with personal stakes and gut-wrenching revelations. Was Tony Stark responsible for creating the Incredible Hulk? Bruce Banner and Tony Stark are in for an emotional rollercoaster thanks to the events of Original Sin. 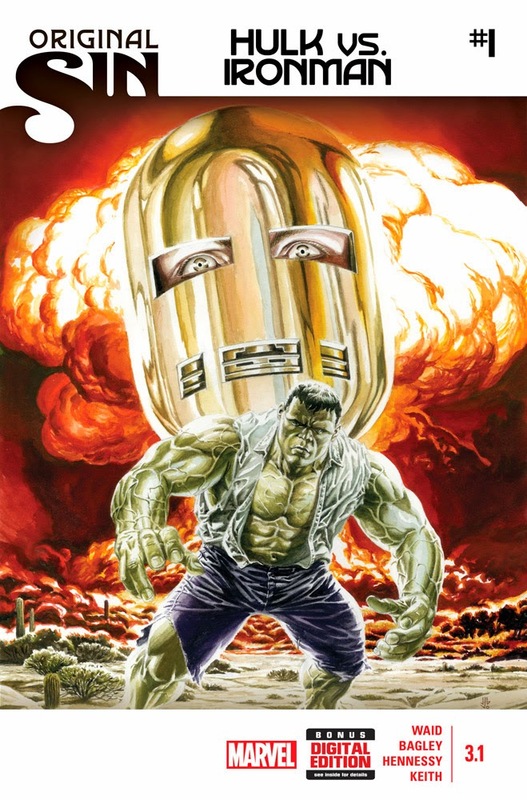 The secret history of that fateful day stands revealed, and it’s about to set Hulk and Iron Man on a deadly collision course. When the dust settles – who will be left standing? 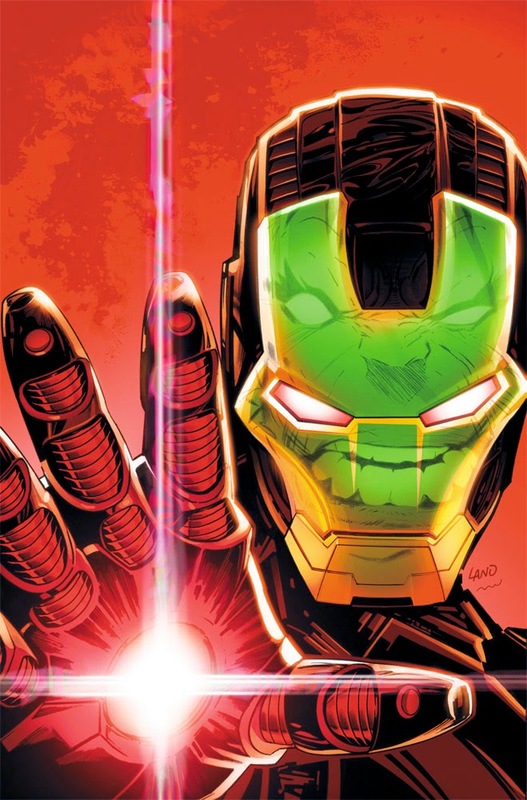 Find out when the two Avengers go toe-to-toe this June in HULK VS. IRON MAN #1 – an Original Sin tie-in! This June, the Sorcerer Supreme faces his greatest challenge yet in NEW AVENGERS ANNUAL #1 – from rising-star writer Frank J. Barbiere (Five Ghosts, The White Suits) and acclaimed artist Marco Rudy (Marvel Knights: Spider-Man, Swamp Thing)! 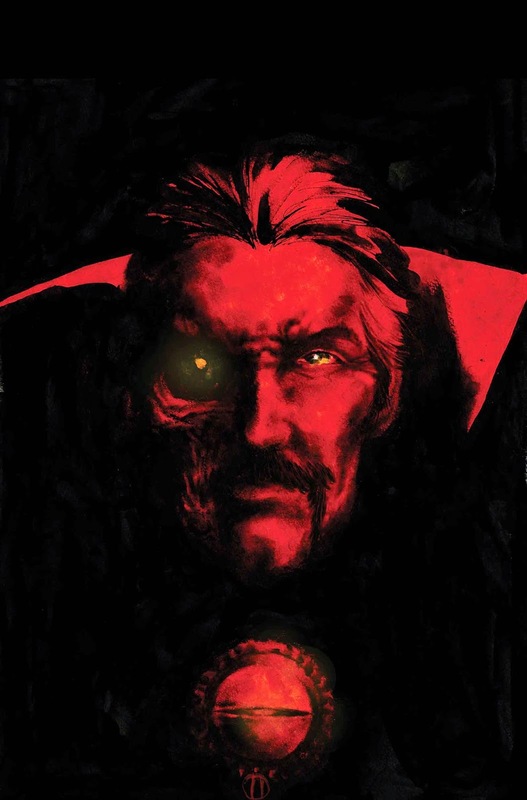 Spinning directly out of the pages of New Avengers comes an all-new tale of the Sorcerer Supreme full of suspense, intrigue and horror. Comics Creator Billy Tucci streaks his Shi 20th Anniversary Celebration Tour into “The Grand Canyon State” to debut the exclusive “Shi – Way of the Warrior #1 Phoenix Comic Con 20th Anniversary Edition” this June 5-8th 2014. “Hands down, the Phoenix Comic Con is one of our favorite and most successful conventions!” exclaimed Shi creator and publisher Billy Tucci, “ And Phoenix is also the home of Brian Miller and the crew of Hi Fi Design who digitally painted the exclusive cover “Manga Dansu”, so this year will be doubly special”. The multi-Eisner award nominated Shi debuted in 1994 with the modern-day samurai fable, “The Way of the Warrior” #1”. Illustrated by Tucci, co-written with Peter Gutierrez, and colored by Barry Orkin, “Way of the Warrior” transcended independent publishing with a unique melding of Japanese mythology, history, and action not seen before in comics and became an instant comics classic. 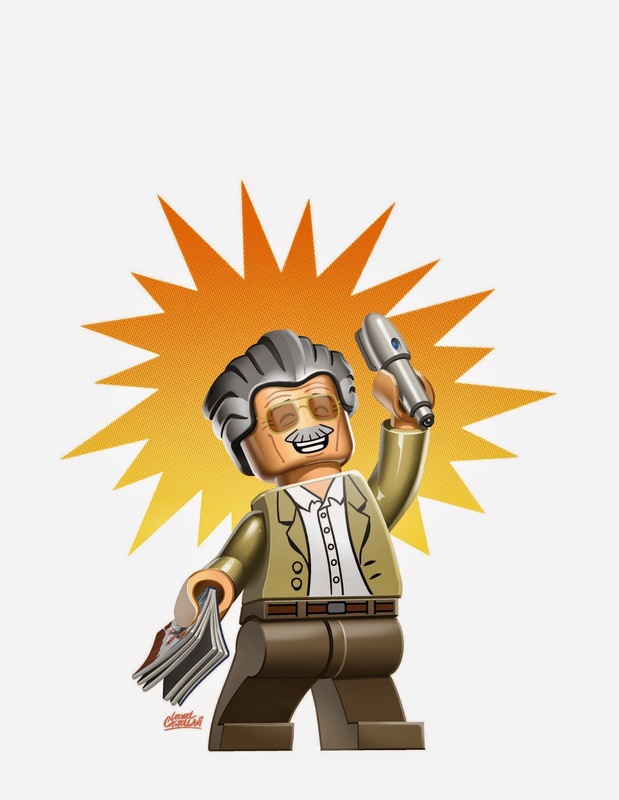 The past three editions created for the London Super Comic Con, MegaCon and C2E2 instantly sold out, making these the rarest and most collectibles Shi comics ever. But as per custom, the PCC Exclusive is limited to only 25 copies and each comes signed and individually numbered with a set price of $60.00 US. In a few short years, the Phoenix Comic Con, the signature pop culture event of the southwest, has rapidly grown to become one of the largest conventions in the country, rivaling even Comic Con International in San Diego. And with the large Manga/Anime attendees and publishers present this year makes for a natural pairing with the Tucci’s “Manga Dansu” cover. This September, leap into tomorrow as the Marvel Universe fast forwards 8 months in AVENGERS #35 andNEW AVENGERS #24! 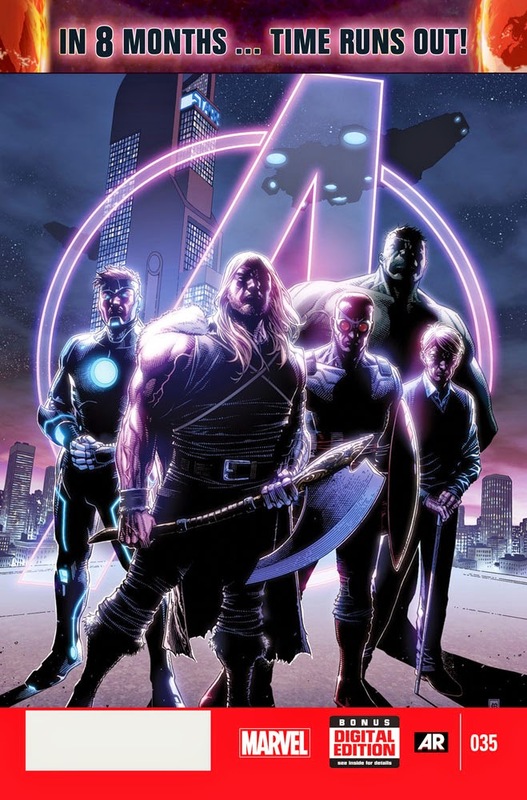 All-Star artists Jim Cheung & Mike Deodato join New York Times Bestselling writer Jonathan Hickman for two oversized issues taking readers to the battle-worn Marvel Universe of tomorrow. But how could this all happen? The Incursions by parallel Earths from other dimensions have increased in number! To save both universes, each time one Earth must be destroyed! Up until now, the Illuminati has dealt with this problem in secret! But 8 months from now, who is left to shoulder this burden—and is the entirety of the Marvel Universe itself doomed? As these two epic issues jump forward into the future, what has become of Earth’s Mightiest Heroes? With the war between the Avengers and the Illuminati at its peak, who will be left to fend off the Final Incursion? Who are the new Cabal? And…what is coming in May 2015? The clock is ticking and your questions will be answered this September in AVENGERS #35 and NEW AVENGERS #24! This June, the fall of the first family continues in the explosive FANTASTIC FOUR #6 – a tie-in to Original Sin! From Eisner-award winning writer James Robinson, fan-favorite artist Leonard Kirk and the peerless Dean Haspiel– they’ve been a family ever since that fateful day they ventured into the cosmic unknown, the day the Fantastic Four were born. 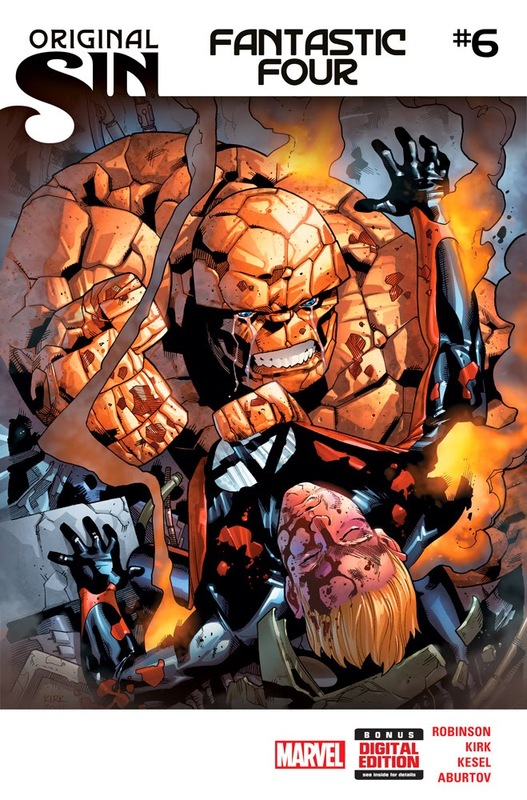 Bonded together as family, Johnny Storm became the hot-headed Human Torch while Ben Grimm became the hideous monster known only as The Thing. Try as he may, super-scientist Reed Richards was never able to reverse the process and return Ben to his normal form. It is a failure that has haunted him to this very day. But what does Johnny have to do with Ben’s irreparable condition? And why has he lied about it all this time? Now, thanks to the events of Original Sin, Ben Grimm is about to learn that his closest ally has condemned him to a life sentence as a monster. And he won’t be happy about it! Bruised, beaten and broken both emotionally and physically, is this the end for the Fantastic Four? The dismantling of the first family continues as Reed, Sue, Johnny and Ben crash headlong into Original Sin this June in FANTASTIC FOUR #6!